reading nook blend from plum deluxe. I firmly believe tea is one of the loveliest beverages to have on hand while reading. Imagine my delight after being contacted by Plum Deluxe and seeing an offering on their site called the "Reading Nook Blend." I was immediately intrigued. I was sent a few others to try, but this one is being reviewed first as it arrived while I was studying for midterms. Seemed like a perfect brew to help me relax and stay alert! This blend contains a cream black tea base along with rosebuds, passionflowers, lavender, and chamomile. 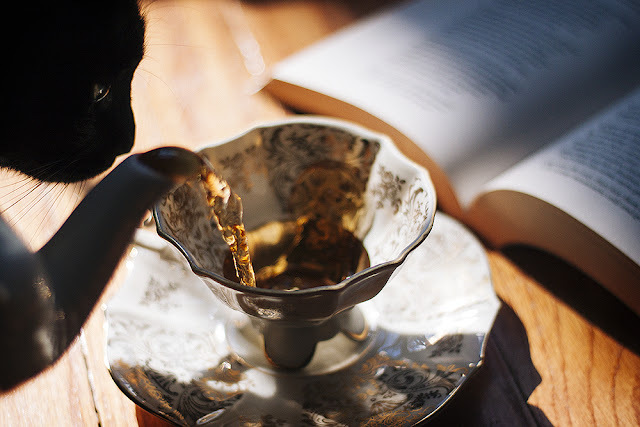 It brews up a radiant amber cup and the scent is incredibly pleasant. You get a strong floral aroma but the creaminess of the black tea base keeps it from being too perfumey. The flower I can detect right off the bat is the lavender. The bright flavor bursts through and is followed by a slightly spicy rose note. I pick up on a soft sweetness that I think is from the chamomile blossoms. The notes all blend together in such a way that no floral overpowers another. 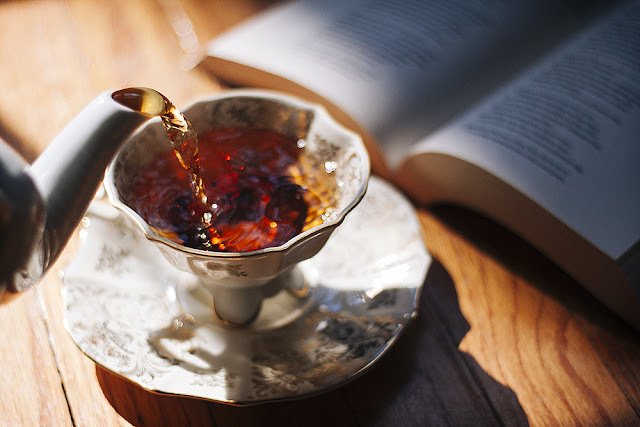 The balance of the aforementioned notes over the creamy base tea makes for a relaxing cup and is well suited for an afternoon spent reading. I also found this tea to be immensely enjoyable with a touch of raw honey. The honey amplified the creaminess of the base and allowed some of the brighter notes of the flowers to come through. Plum Deluxe teas are organic, GMO free, hand-blended, and fair trade! They offer a Tea of the Month Club which features a monthly limited-edition blend for members only as well as a second tea sample. I'll be writing about their Deluxe Pumpkin Spice and Peaches n' Dreams Oolong next! Even Chai couldn't get enough of the sweet floral aroma!